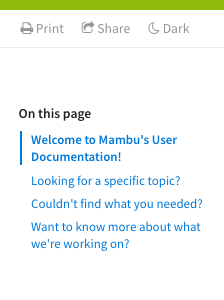 Welcome to Mambu's User Documentation! This site is a comprehensive guide to the way Mambu works - a valuable resource for understanding and getting the most out of Mambu. There are several ways to find information in our documentation. The Navigate Pane along the left side of the window (highlighted in orange, above) gives you an overview of all the available content. Click on a category name to see the sub-categories and articles available and click an article name to navigate there. You can filter the articles shown in the Navigation Pane by entering keywords into the "Filter" box at the top (highlighted in blue, above). When articles have multiple headings, the On this page menu will display on the right-hand side of the screen. The current heading will be bolded and this will update as you scroll. Click on any heading to jump directly to that portion of the page. Enter your search terms into the box in the center of the header. A list will display with all the articles related to what you're looking for. 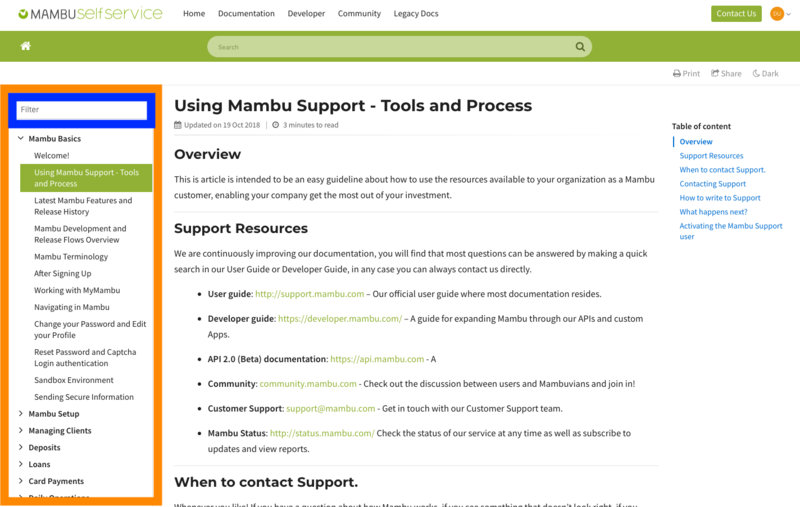 Try out the Mambu Community where users and Mambuvians post questions and participate in discussion together. We're also constantly adding articles and improving our User Guide. Get in touch with us if you have any questions about this content and please help us identify any topics we're still missing! We'll make sure you get your answer and a new article will be published in just a few days. Want to know more about what we're working on? Have a look at the latest features we've included on our latest releases here.